Body acne. It’s not something that anyone looks forward to experiencing. But for millions of people out there, it’s a reality. 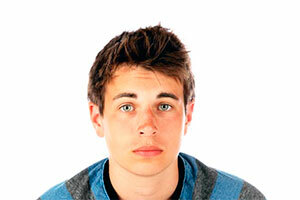 Acne is a skin issue that can hit at any age, and produces unsightly red bumps that vary in number and severity. 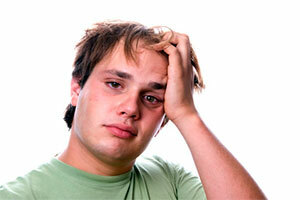 Even though the most common area for acne to show up on is the face, the rest of your body can be hit with it as well. One of these areas is the back. There are a number of factors that come into play when it comes to the reason and risk for this “bacne.” If you’re suffering from it, don’t despair — treatment options are abundant. Acne is a grouping or collection of pimples. A pimple is formed when dirt, oil, and dead skin get trapped inside one of your pores. Once this happens, bacteria can start to grow and multiply, swelling the area and turning the skin around it red. Pus can be produced by the bacteria, making a white bump in the middle of the pimple. Back acne can happen to anyone at any age. Back acne is usually the result of sweat that accumulates and clogs pores with dead skin. But it can be hard to even see if you’ve got acne there. If you don’t want a friend to help you determine if you’ve got bacne, try using a mirror. If you’re interested in more detailed information about what causes back acne, go here. Acne on your back will usually be in the areas that you sweat the most, and will look like groupings of red, swollen bumps. Many of them will have a white head. Sometimes they will itch or be tender and bothersome. 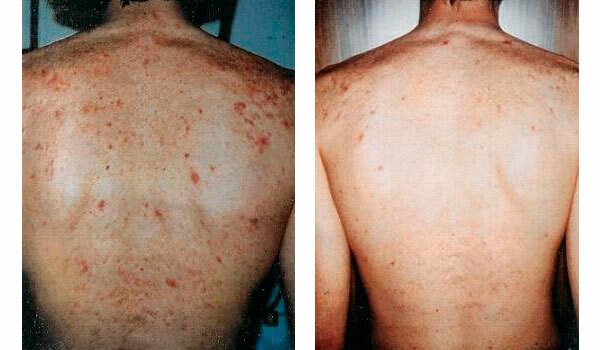 Severe back acne: This happens when the groupings of pimples spread all over your back. They usually are deeper and swell more than average. Lower back: Bacne isn’t limited to your upper back. Because sweat drips downward, acne can start to form low on your back as well. 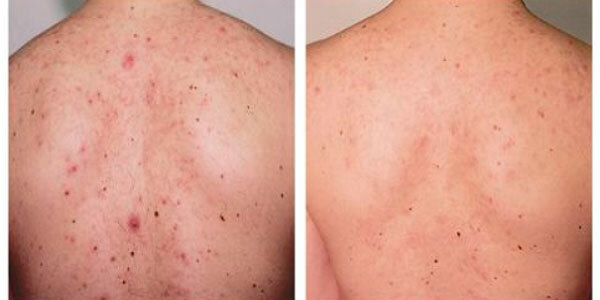 Mild acne: Back acne isn’t always severe and painful. Sometimes it’s just a nuisance and you only get a small amount of pimples. Bacne in teenagers: Hormones play a part in the formation of acne. Since teens have an increase and fluctuation in their body’s changing hormones, it can increase the chance and amount of acne. Teens aren’t the only ones who can experience back acne due to hormone fluctuation. During pregnancy, a woman’s body produces all kinds of different hormones that can cause acne to show up, even if she never experienced it before. Birth control can also increase your chances of body acne, as well as a woman’s monthly menstrual cycle. Breakouts: Sometimes, your body can go from no acne on the back, to a whole breakout of it. This fluctuation could be from an increase in sweat, or regular changes in hormones. When it gets really bad: When bacne changes from a breakout into a regular, constant problem, it’s considered chronic acne. And sometimes it doesn’t just stay as a round of pimples, it can develop into cystic acne, which is a condition that involves pimples going very deep into the skin. This is usually painful and hard to treat. Want to know more about how to get rid of back acne? Find it by clicking here. In cases of back acne that involve pain, it is more a difficulty to live with. Cystic acne can occur on the back. This is when the clogged debris and bacteria move deep into the pore, swelling the area more than normal and producing large, red bumps on the skin. Because of how deep it goes, the material inside the pore can’t be squeezed or flushed out like a regular pimple. Antibiotics and steroids can help clear up acne. If you’re experiencing pain, it’s wise to consult a physician. Sometimes the only way to relieve yourself of the discomfort is through professional help. Options that are available include medications like antibiotics, salicylic acid, steroids, and other topical creams and gels. Some of these are taken orally, and some need to be applied on the acne’s surface. Since the back is such a hard to reach area, find a friend or loved one to help with application. There are different acne products specific to different areas of the body. Body washes and creams for the face might not have the same effect as ones made for the body, and vice-versa. When in doubt, talk to a medical professional or do some research to learn which specific treatments can be used for back acne. For more details on back acne treatment, go here. You can also take preventative measures when it comes to back acne. Changing shirts that are sweaty or dirty. Using acne fighting body washes. Wearing shirts with breathable, light fabric. Remember, having acne on your back doesn’t have to be a life-long struggle. Get all the facts so that you can diagnose and treat it. If you’re careful and understand how to prevent and manage it, you’ll be well on your way to a clear, smooth back for good.